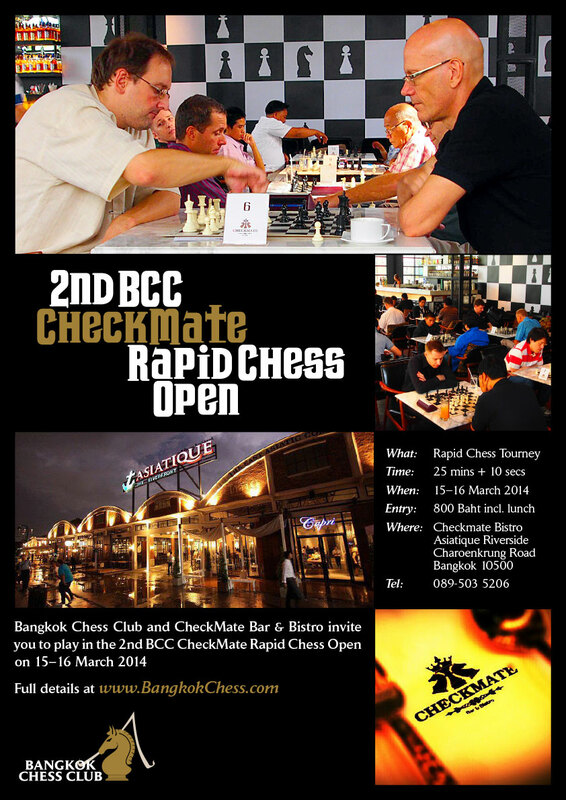 The Bangkok Chess Club and CheckMate Bar & Bistro have the honour of inviting all Chess Players to participate in the 2nd BCC CheckMate Rapid Chess Open from 15th to 16th March, 2014 in Bangkok. This is an individual tournament, open to all players with FIDE ID. The maximum number of players is 50. There will be cash prizes for the first three players, and the first prize will be Baht 5,000. Prizes for best junior and best lady. Baht 800 (late registration after 2.3.2014 Baht 1,000). All tournament fees must be paid before the start of the first round. The entry fee includes buffet lunch at CheckMate on both days. Please complete the online registration form. The organizer will confirm your registration by e-mail. If you do not get a reply within a week, please send a reminder to bangkokchessclub@gmail.com. The deadline for registration is March 2, 2014. After this a late registration charge will be added. However, organizers reserve the right to refuse or decline late registrations. The maximum number of players is 50, and maximum 50% can be non-fide-rated (all players must have FIDE ID).